Class of 78 Together Forever! 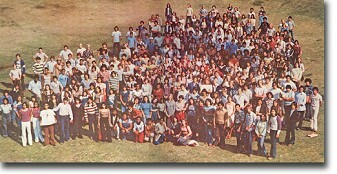 Welcome to the official Madera High Class of 1978 website. This is the place to connect and catch up with classmates. 40th Reunion was a Blast! The Class of 78 rocked it at our Friday night reception at Peters Brothers Nursery (thank you Kevin and Kurt). and Saturday night dinner/dance at Birdstone Winery (thank you Tony Kirk). See and share photos here and on our Facebook page. Special thanks to our classmates who organized and supported the events! If this is your first visit, please go to Get Your Password to learn more about the site and how to use it. It's free to join, so get started now! Go to the Class Contact List page to download a printable list of classmate contact info. Join the ongoing dialog among classmates in the Message Forum. Log in to see the latest posts (at the bottom) and add your own comments. Help Us Find Our Classmates! The list of names in Classmate Profiles was created from our senior yearbook. We do not have contact information, especially email addresses, for MANY people. Please review the list and if you know the email address for anyone who has not created a profile yet, please click their name and use the built-in function to send them an automatic invitation to join the site. Or you can use the Contact Us link to send us their contact information. If you are a member of the Madera High Class of 1978 and your name is not on the list in Classmate Profiles, please use the link at the bottom of that page to notify us. We will add you to the list, then you will be able to join and create your profile. This site will be maintained and open for all to use as a way to reconnect and stay in touch with classmates. Enjoy the website!